Del Mar's 79th summer season opening day was a very good one on the track for trainers Doug O'Neill and Hall of Famer Jerry Hollendorfer and on-track, for Del Mar Thoroughbred Club CEO Joe Harper. O'Neill won four of the first five races, to move within one of the track single-day record he set on July 29, 2015. And off-the-board results with six runners in the next four races did not, of course, affect O'Neill's unfailing enthusiasm. “Just an incredible feeling,” O'Neill texted Wednesday night. “The energy was so high at Del Mar and our barn got some really great rides and lucky trips in some compact, large fields. Hollendorfer saddled three winners. Seventy-five percent of the number O'Neill recorded on the day and 60 percent of the stable's win total during the entire 2017 summer meeting. Harper, who has experienced opening days since becoming a DMTC executive in 1977, expressed delight Thursday morning with the latest one. “Manageable crowd (33,112), amazing handle ($16,131,880 all-sources, up 14 percent from 2017) and a wonderful card put together by the racing office,” Harper said. The handle was the second highest for an opening day behind the $16,500,914 of 2016. The 2016 opener was on a Friday. “All in all, an excellent day,” Harper said. Trainer Doug O'Neill's four victories on Wednesday were produced by Popular Kid ($8.20) in the first race, Jimmy Chila ($7.00) in the second, Dichotomy ($5.40) in the fourth and Ann Arbor Eddie ($20.00) in the fifth. Rafael Bejarano got the ball rolling aboard Popular Kid in the first, Mario Gutierrez kept it going for the next three, with the most surprising being Ann Arbor Eddie (9-1), a 4-year-old gelding who hadn't won in over a year and was 0-for-9 with two third-place finishes in that stretch. 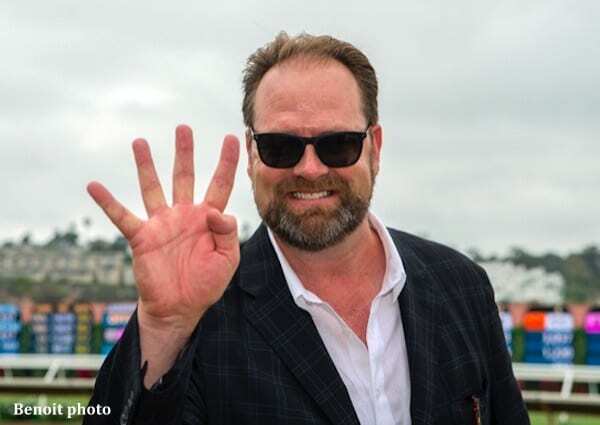 Runner-up efforts at Santa Anita in May and early June led to a fourth-place finish, albeit with an improved Beyer speed figure, a month ago that made Wednesday's effort somewhat less surprising to Team O'Neill than it was to the bettors. “We've been waiting for him to give us one good race like yesterday,” O'Neill assistant Leandro Mora said. “The last race he ran we were a little bit disappointed because we expected the type of race he ran yesterday. Hall of Fame trainer Jerry Hollendorfer's three opening-day wins came with Eighty Three ($10.60), Shivermetimbers ($4.40) and Brill ($3.40), the latter as the 7-10 favorite making her racing debut in an event for 2-year-old fillies with a field rife with candidates for juvenile stakes in the near future. A $1 million purchase at the Fasig-Tipton July sale last year, Brill came from off the pace to win by 1 1/4 lengths going away in a time of :57.86 for five furlongs, nearly two seconds faster than a similar event three races earlier. Brill is short for brilliant. “When the bigger races, the stakes, come up, usually you've got a lot of horses that have gone wire-to-wire. You're looking for one that can set off the pace and she's already done that. Hollendorfer-trained Eclipse Award winner Unique Bella worked six furlongs Thursday morning in a bullet 1:11.80. Battle of Midway went five furlongs in :48.40 in his first work since returning to training after an unsuccessful career as a stallion. Unique Bella is being targeted for the $300,000 Grade I Clement L. Hirsch on July 29. Being as early as he is in his racing return, Battle of Midway is unlikely to be ready to run during the meeting. Brill may next be seen in the Grade I $300,000 Del Mar Debutante on September 1. Two-year-old colt Instagrand, an impressive recent debut winner, is being aimed for the $200,000 Grade II Best Pal on August 11. This entry was posted in People and tagged dan ward, del mar opening day, del mar thoroughbred club, doug o'neill, jerry hollendorfer, joe harper, leandro mora by Hank Wesch /Del Mar. Bookmark the permalink.